Sony Lock Remove File Downloader application is for Windows which allows you to download the Sony Xperia Lock Remove file for almost every Sony Xperia Smartphone and Tablets. Download All Sony smartphone Pattern Lock remove firmware.All Pattern Lock remove file 100% Tested & awesome working.All Gsm friends for happy this Post. 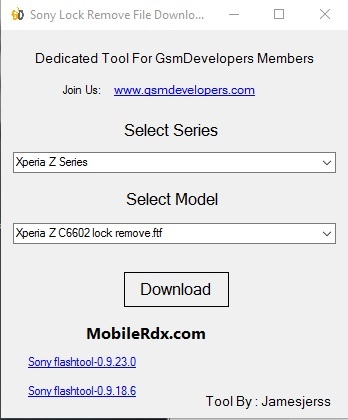 Original Sony Pattern Lock, Pin Lock, Password Lock, Privacy lock, Hang on Logo Remove firmware download.its firmware flash Tools Support Ftp Format.Also, Support Sony Xperia & Sony Ericsson flash Box Supported. Why use This Sony Xperia Pattern Lock Remove ftf file? Sony Xperia updates all smartphone Hang On Logo, Pattern Lock, Privacy lock, Password Lock, Pin Lock Problem.Download your targeted selected flash file & flash your smartphone. How To flash Sony Xperia Pattern Lock remove the file? Download Sony Xperia Latest Flash Tools.Unzip flash Tools & install.Setup all Model Sony Xperia driver.Download your targeted ftf file.Open Sony Xperia installed flash tools.Load Your flash file ftf file.wait for flash file load completed.Press Flash Button.Charge your smartphone Battery At least 50% better.Off your Phone.Reconnect Battery.Insert usb Good Cable.flash Running? Wait for a 2-5 minute for flash Complete. Credits: Sony Lock Remove File Downloader v1.0 is created and distributed by Jamrdjerss. So, full credits go to Jamrdjerss for sharing the tool for free.